I see that Dan Baxley is based in Clearwater, Florida -- certainly he is the connection to Kip's participation in the Gasparilla and other southwest Florida races. I'm a fairly regular participant in Clearwater/Tampa area races, and I've never seen Baxley's name. I just did a search of local race results, and he doesn't show up, which supports the notion that he has no real running expertise. He graduated from UMichigan (perhaps around the same time as Kip) and attended Kellogg school of management (one of the top MBA graduate business programs in the world). he posted here on KL thread #1 but has not posted since his profane tirade defending Kip. I would love to see him post again defending Mr. Litton. He has been silent since his outburst. some have speculated that Dan Baxley might be Kip himself. also, there are questions as to whether Ben Millefoglie (Kip's web designer/webmaster) actually is a real person, or whether it is Kip himself. What's a bit suspicious (besides that this guy's name is in the coding for some of Kip's fabricated race websites) is that Mr. Millefoglie has a whopping 7 connections on Linkedin ( http://www.linkedin.com/pub/be...e/7/574/6A), and a whopping 5 friends on facebook, and it appears that perhaps 1 of the 1st friends Mr. Millefoglie friended on facebook was Kip Litton. and does anyone know if Ben actually exists? Proof, I was really responding to 'New Theory' Dont ever post here..I see I clicked on the reply from your post. Having a co-conspirator would be the easiest to pull off given there was a trusted co-conspirator. But I cant explain why someone who has 3 hour speed (at least for part 1/2 a marathon) would give themselves up to get Kip results. Unless there is a true 3 hour marathoner who gives Kip's chip a ride in the middle part of tha marathon. But, if this were the case, I think someone would be able to tie someone else's results to Kip given the frequency of attempts during his heyday. This was posted page 19 on this thread, where it shows the Ben Millefoglie guy in the Meta tags of the html source. Ben Millefoglie appears to be a real person, and is an officer of New Venture Vending, Inc.
www.newventurewebs.com, the website that did the design of Kip's website, does not appear to be a properly formed corporate entity in the state of Michigan (at least from my cursory search of the state database). However, their mailing address is the same as New Venture Vending, Inc.
Maybe Ben Millefoglie is business partners with Art Vandelay. http://www.newventurewebs.com, the website that did the design of Kip's website, does not appear to be a properly formed corporate entity in the state of Michigan (at least from my cursory search of the state database). interesting. so did Kip get Ben Millefoglie to design websites for Sandy Springs and Pine Hill and perhaps others? Dumpwater is the Headquarters for Sc$entology. Maybe Dan is really D.M. or another kook. It would explain a lot about Kip's behavior and the crazy schemes. Maybe even his thetans helped him cheat. Lord Xenu. Master of all distances. Exactly, HE CHEATED! No mystery here. Help or not, HE CHEATED! Look at him come through the chute, in almost every race he jogging or walking, except for a couple of exceptions, probably due to the fact that he had cut in later in the race and had more energy. I know, quite a laugh, but I beat it's true. Anyone can put a distressed look on their face for a camera. Heck I am doing it right now as I read through all these pages. As a couple posters have said many page back, he will make money off this and that will be a crying shame. RE: favorite thread page 10/20/2011 1:19PM - in reply to yessaasir!!!! Yeah I had some misspellings but I am pissed that this guy is getting away with it. Watch, suddenly he won't be able to run anymore or for a long, long time due to injuries. Is there some way this could be made a sticky. It should never leave the first page...until Kip confesses. Come on guys. I get why the compression socks are rolled down at the start. I get why he is wearing a windbreaker covering his race number at the start. But i don't get why and how he changed his goddamned baseball hat. Runnerrer wrote:But i don't get why and how he changed his goddamned baseball hat. The "how" is yet again that he has a full range of kit in the vehicle he moves between the timing mats in. The "why" is presumably to fool any cameras - but it doesn't work. Those ARE totally different shoes as well. Look closely. yes they are. the ones the subject is wearing early on have a blue stripe on the front toe area. the ones the subject is finishing with are pretty much all white. That looks like him turned around, like he is looking for someone or to see if someone saw he jumped on the course or something. 2) he's the last one way in the back to cross the starting line so that when he skips off the course after at least the 1st 1/4mile, any other runners in the race won't notice. 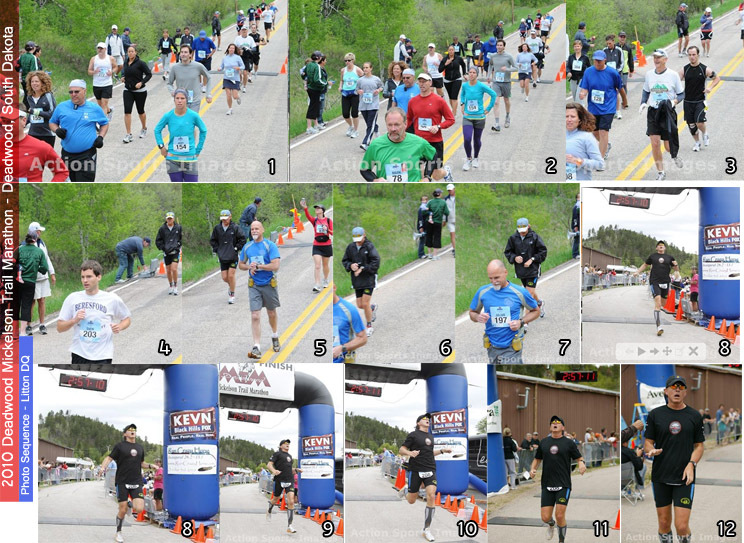 This time though Kip f*cked up because these pics in his black raincoat disguise made their way into race photographers' Lost & Found section (where we can see them). I wonder how potty mouth KelloggMBA grad Dan Baxley can explain that one.